For the people of Melbourne in 1858, it must have been as mind-blowing as watching man land on the moon. On February 1, 1858, Australia's first successful hot air balloon flight took off from Cremorne Gardens in Richmond and was the start of aviation in this country, 50 years before aeroplanes. The Victorian Balloon Association and the Richmond Historical Society will mark the 150th anniversary with a free public breakfast and balloon and historical displays on Friday, February 1, 2008. In 1858, Richmond was rural. This was before the town hall tower, the St Ignatius spires, Dimmeys, trams or trains. Richmond's great attraction then was entrepreneur George Coppin's Cremorne Gardens, a 4.5-hectare pleasure park with the Pantheon Theatre, a pub, a zoo, a bandstand and a lake. According to Helene Rogers' booklet, Early Ballooning in Australia, Mr Coppin imported the colony's first white swans and goldfish. His steamboats ferried crowds from the city along the Yarra River. In the summer there was opera, ballet and theatre performances, bands, fancy dress balls and fireworks displays. On a talent finding trip to London, Mr Coppin enticed experienced balloonists Charles Brown and Joseph Dean to Melbourne. Brown brought his home-made 18-metre-high muslin balloon, the Australasian. The day before the Richmond flight, the Australasian was partially inflated with coal gas at the City of Melbourne's gasworks at Batman Swamp, in West Melbourne. It took 30 men and a horse and cart to walk it to Richmond. The next day, the balloon was topped up with gas from Mr Coppin's gas-making plant, which fuelled his gardens' lighting. He had doubled the normal entry fee to five shillings, but most locals watched free from outside the gardens. The Argus reported: "Every eminence from which a view of the gardens could be obtained was dark with human beings .. everywhere but in the grounds themselves." Brown and Dean were to co-pilot, but escaping gas and a strong breeze caused havoc until the basket started to rise when Brown hopped out, leaving Dean to fly the balloon. He later wrote in the Evening Mail: "Looking down I saw thousands of upturned faces in every street and road surrounding the place from which I had taken my departure." He described feeling "raptures of delight" at the sun setting over the CBD. After 25 minutes he landed at Plenty Road, near Heidelberg, and paid a passer-by to take him and the balloon back to Richmond. Rogers' book says that when Charles Brown flew two weeks later, he was bashed on landing in Collingwood by a superstitious mob who thought it evil for humans to fly. The Cremorne Gardens closed in 1863 and today the land - between Balmain Street and the Monash Freeway in Burnley - is mainly dense housing. The Victorian Balloon Association's Peter Dutneall said hot air balloons today used propane gas, live flame burners and canopies made of tear-resistant nylon, and ascended by blowing hot air into the canopy rather than dumping sandbags. But they still rely on catching air currents to change direction. Celebrations will be at Citizens Park, in Church Street, from 6am-9am on February 1. -:- November 21, 1783 The first manned, untethered balloon flight takes place in Paris. 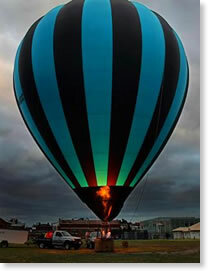 -:- February 1, 1858 The first Australian balloon flight takes place in Melbourne. -:- December 17, 1903 The Wright brothers' first powered aeroplane flight takes place in Kitty Hawk, North Carolina. -:- November 13, 1907 The first piloted free helicopter flight takes place in Lisieux, France. -:- March 18, 1910 Harry Houdini makes the first controlled flight in a powered aircraft in Australia at Diggers Rest, Victoria. -:- June 20, 1939 The first flight of a manned rocket-powered aircraft takes place in Peenemunde, Germany. -:- July 20, 1969 Man lands on the moon.